Oh Wiesbaden, we have history…. It was the first triathlon I ever entered, back in 2011 and this year would be the forth time I had headed over to Germany for it. 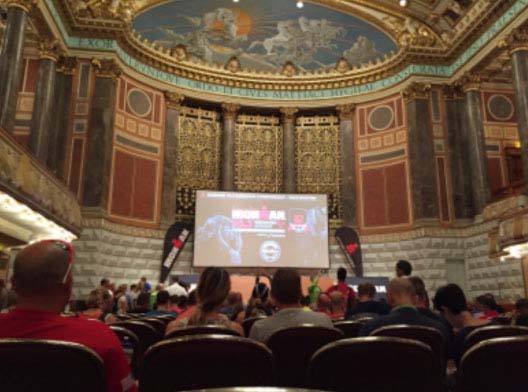 The first time was a rude awakening to what a very hilly 70.3 felt like the second was a DNF due to a crash on a steep decent, and the third time, last year, was pure redemption and a sub 5.30 finish, which put will well up in my AG. 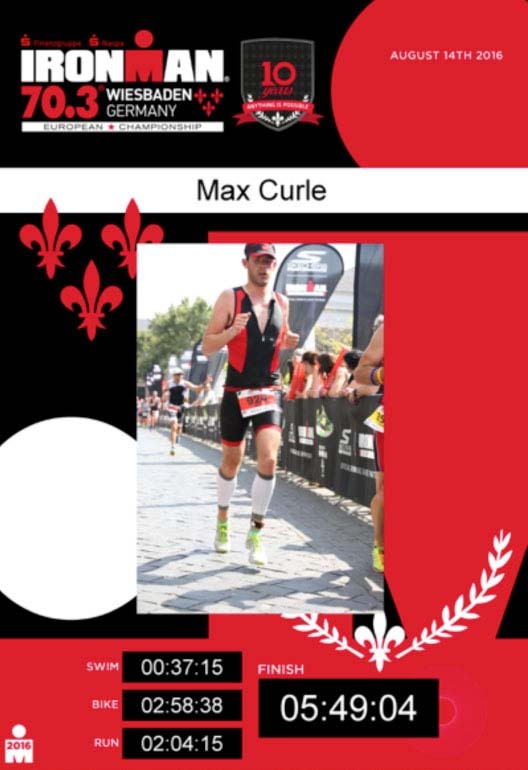 This year I had set 3 goals for the race, firstly a sub 3 hour bike, which would mean a 30kmh average, and with 1455m of climbing that wouldn’t be easy, and quicker transitions to last year…. and to beat last years 5.28. Travelling back and forth to Frankfurt twice in the previous few days wasn’t really ideal, and 5 days holiday in Ibiza a couple of weeks ago wasn’t what ‘the coach’ would necessarily suggest but nevertheless it was fantastic and greatly needed. Besides I had put in some serious work in the 2 weeks before Ibiza and got back to it the week after. Not much had changed from last year other than the swim course and a small stretch at the end of the bike due to road works. After the briefing I headed to the lake and dropped my kit in T1 and headed back to hangout with the wife and my son, in fact we went swimming…. well splashing! I had driven the course on the Saturday morning before the race briefing so all there was left to do was force massive amount of food into my belly and try and get an early night, thankfully, Jona obliged. Last year I clocked an Ok (for me) 37mins but had swam the long way round, the swim course had been slightly changed, due to the lake being a working lake which sand is dredged from, so the shape and depth of the lake is different every year. However being sand based it is always clean, if not always clear! This year the course was mushroom shaped, and the same entrance/exit point was used on the shore. The rolling start helped me focus on my own swim and stay relaxed and with last song I heard in the car on the way (Karma Chameleon) in my head I focused on my technique, and not my sighting, as the mushroom shaped course wasn’t the easiest to follow, I exited in 37 minutes. But T1 was quicker, yey!!! T2 was quick, less than 2 minutes, but I knew almost straight away I was in trouble my quadriceps muscles were cramping with every stride, Nevertheless the first 2 km passed in 4.40s, 5km passed in 23.30, but after the first lap the cramping returned and my pace slowed, then the pain got worse and I walked, then I stopped and stretched…. this felt rubbish Run walk run walk for 13km wasn’t fun but eventually I got there feeling a little dejected I entered the finish area and saw Inga and Jona furiously waving at me, this spurred me on a little and I managed at least to finish by running over the line! I had eaten plenty on the bike and in the days before, lots of salts. Once I uploaded my Garmin I had an idea of where I went wrong, I just pushed too hard on the bike, too many watts had fatigued my legs just too much… Once over the finish line I met up with Inga and Jona, Inga knew I hadn’t finished in the time I had hoped but Jona first words in front of me were ‘I need a wee-wee, can I do it on the tree’? (He’s potty training). Of course I am a little disappointed that I didn’t perform as I had hoped. It’s a great event and well organised. There was a lot less spectators than in previous years, as well as added security at bike check-in and transition, sadly, perhaps just a sign of the time over in Germany. Life is good, and I get to do it all gain next Sunday!!! 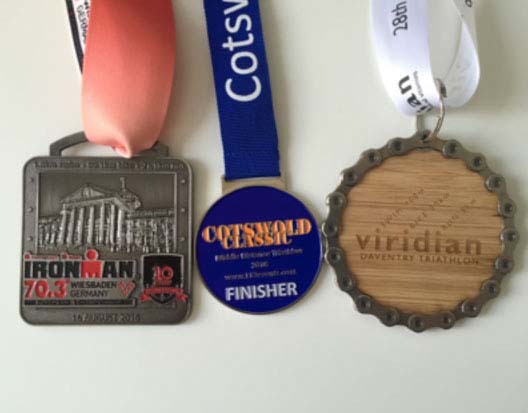 So I entered this race when Inga had decided that she and Jona would be spending a week in the USA with her parents, it was never really a conscious thought that I would be doing two 70.3’s in consecutive weekends, but once I realised I could I thought I would. It would be a good challenge if a little daft! The past week consisted of travelling back from Germany, a couple of massages and limping around, a couple of light Wattbike sessions and a jog around the park was the only ‘training’ I did. The pain of the cramps I suffered in Wiesbaden stayed with me for a few days, and to be honest I could still feel them on Friday and even at the start I wasn’t 100%. It wasn’t just me this time I had two clients taking part as well as a couple of other familiar faces, and Chris from @methodtriathlon came along to offer his unique style of support. The night before a group of us headed into Swindon to an Italian restaurant to get stuck into the pasta and bread, then I was back to my hotel for an early night as I was due to start at 7.10am. The event is in the heart of the Cotswolds; the swim in is a shallow water sports lake. In fact the organisers informed us the lake was particularly shallow, and in parts so shallow it was possible stand up in. We were let off in waves of approximately 100, and followed an M shape course across the lake. As we were told the lake was very shallow in parts, so shallow in fact I could of pulled my self along with my hands on the bottom in parts. The first 400m I felt awful, tight shoulders, couldn’t get my breathing right, I was convinced I was going to get cramp… We turned the left at the first buoy and I slowly began to relax, my arms and shoulders began to feel looser and I slowly started to pick up speed. I suddenly found myself swimming along side my client, I recognised his wetsuit, we stayed together for about 800m, perhaps it spurred us both on a little bit. I exited the lake in 33mins. 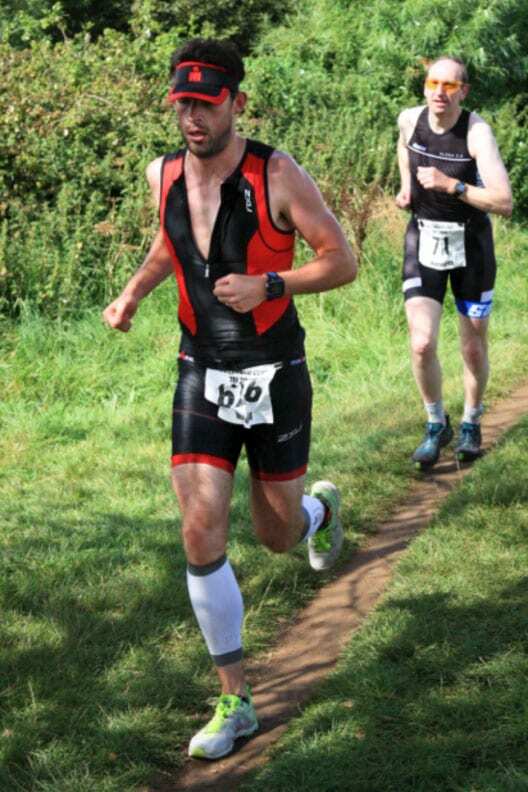 My first transition was quick enough, wetsuit off; shoes and helmet on and off we go. The bike course is two laps of a P shaped course, it only has 1 hill on each lap, and that hill is only a couple of hundred meters long. So gauging my effort using my power meter was going to be important, especially after over cooking it on the bike last week in Germany. I had already decided that I would try to keep to 65-70% FTP around 210w, even if this meant sacrificing speed in the hope of saving my legs for the run. The winds were strong and on the way back it was directly blowing into my face making the ride feel harder than perhaps it should of. The nature of the course made for constant effort, no hills also means no rest on the downhill’s, so by the T2 arrived my legs were feeling heavy. The bike course was all on relatively quiet roads however within the last 15km I passed what looked like a serious accident, cyclist – ambulance – parked cars… As competitors wee were asked to dismount and walk past, we have since be informed the rider is doing well, despite a few broken bones. A timely reminder that racing is meant to be fun, but we all have to be incredibly careful. I finished the bike after 2.32. Another quick transition and out on to the 3-lap course. The first half is mostly under the trees on dirt footpaths that rug the edge of the lake we swam in. The shade was much appreciated as the sun was beginning to warm up the air by this point. The second half is mostly on the roads of the local village before heading back to the lake to complete the lap. I took the first 2kms very quickly and soon realised I should slow down to avoid the pain of the week before. 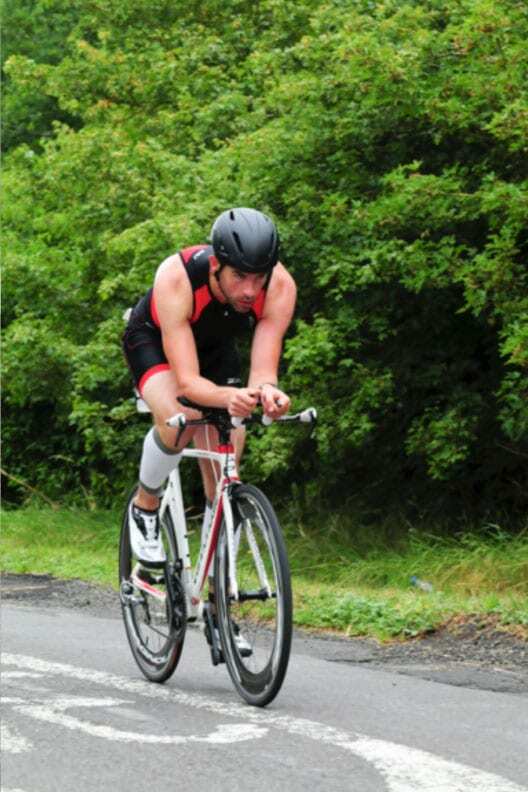 However having done a strong bike I had my eyes on a sub 5-hour finish. The second and third laps began to hurt, but no cramps. I did slow slightly in pace towards the end of the run but crossed the line in a time of 4.56. 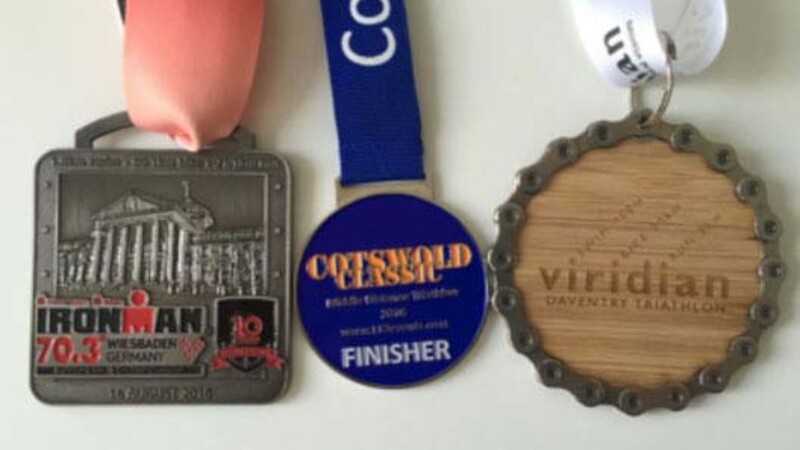 113 events run the Cotswold Classic, they are a smaller brand then the multi-national monster that is Ironman, but they organise a great event, all the marshals are great and the feed stations are very comprehensive. I was pleased with my performance considering I had raced the week before. Had I been fresher I would have hoped to finish in around 4.45. Just Daventry Sprint to go…. This past week was really all about recovery, I had to visit Sarah at Physio Remedies as I had some foot pain, she poked and pulled my foot around and told me it was just some inflammation after the abuse I had given it in the last 2 weeks. Even my left foot was very painful all week. Totally my own fault but nevertheless I was pleased I wasn’t having to chase Jona around this week. Daventry is the town where I went to school and the swim is in the Leisure Centre where I played a lot of basketball in my teenage years. I stayed with friend the night before which made getting to the venue incredibly easy. Having done the 2 70.3s and no speed work for months, it was obvious I would just go 100% from the start and hope the foot was Ok to run… I would stop if the pain were too much. The 400m swim was in the pool, I just went hard from the start, pushing off was a little tricky on the foot, not a great start. I slowed a little in the last couple of lengths but exited in 7.07, the timing mat was on the exit of the swimming pool so by the time I had climbed out of the water I probably wasn’t far off the 6.45 I submitted on entry. I used tri specific shoes for the first time in a race, which gave me a few seconds in T1 & T2. The bike course was a 20km loop on open but quiet roads, and apart from a couple of big roundabouts near transition it was drama free. I over took plenty of other riders and no one came past me, I knew I was on for a decent time, the 2km hill exiting the village of Braunston certainly did drain the legs, but for every up there is a down so it evened out nicely and I finished the 20km in 35.31. I slid on the running shoes and heading off on the run course that took us around the country park, it was strange as I haven’t been there since I was about 10 years old. Anyway the foot began to hurt almost as soon as I began but it was just there constantly and the pain didn’t increase. I kept going, but it wasn’t great, the lack of speed work meant I felt slow and sluggish. The course was on dirt paths and under trees so it was slightly slippery in parts. A couple of guys who had started behind me came past, normally I would try and stick with them but given the foot I didn’t have the top end speed to keep pace. The small hill up to the finish felt like a mountain I was pleased to finish in 18.38… yes, it was slightly short of the full 5km. I finished with a time of 1.03.49 a 10th place overall. I know if I was 100% I would have been slightly quicker but I am pleased that I did this race. Another well organised event. about any of our services or products.